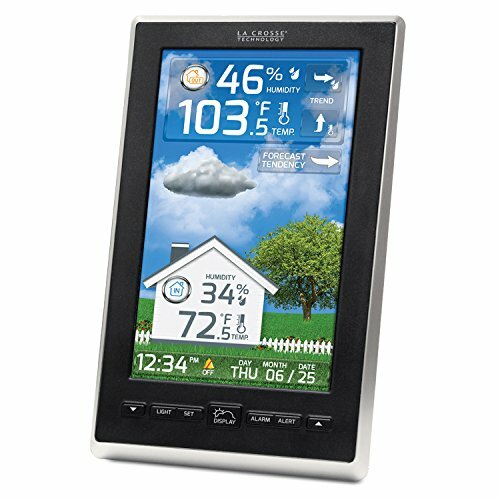 With it's high definition and vivid color, this weather station has personality in a home Forecasting system. With over 45+ photo forecast scenes and multiple display modes, make it your own personal meteorologist! wireless weather resistant outside sensor transmits real-time data straight to your station. It's versatility allows you to customize alerts & settings, and will even suggest opening windows if outside air conditions are just right! our liquid-crystal color weather station is excellent for any weather buff. Manufacturer: La Crosse Technology, Ltd. Publisher: La Crosse Technology, Ltd. Studio: La Crosse Technology, Ltd. If you have any questions about this product by La Crosse Technology, contact us by completing and submitting the form below. If you are looking for a specif part number, please include it with your message.